At least 16 people have been killed in a trolley bus blast in Volgograd, emergency services report, only a day after a suicide bomb ripped through the city's railway station, killing 18. Security has been ramped up across the nation. 19:54 GMT: A special police squad set to be on duty 24/7 has been created in Volgograd, just over a week after the city was hit by two bombings that left 34 people dead. 70 policemen are set to take part, checking all the transport that enters the city, examining vehicles for drugs and weapons, the official representative of the region’s Interior Ministry Svetlana Smolyaninova told Interfax. 16:35 GMT: A special plane from Russia’s Federal Medicobiological agency has arrived in Saint-Petersburg, bringing a victim of the Volgograd bombings for treatment, the agency’s representative told RIA-Novosti. There are currently 38 people in Volgograd’s hospitals, and 22 people have been sent to Moscow to be hospitalized in the capital. 12:58 GMT: The transportation to Moscow of one more person injured in the Volgograd blasts, which was scheduled for today, was delayed until Friday, Jan. 3, reports FMBA press service. It could be connected to the deterioration of the patient’s medical condition, they added. A total of 18 victims of Volgograd attacks are now being treated in Moscow hospitals. On Monday and Tuesday 16 people were flown to Moscow. Two girls were also taken to the capital on Wednesday. 12:34 GMT: According to the investigation's preliminary results, the suicide bombers arrived in Volgograd from one of the republics in Russia’s North Caucasus, a law enforcement source told Interfax news agency. Also, evidence showed that the blast in the Volgograd trolleybus on Monday was carried out by a male suicide bomber, the source added. "A preliminary analysis based on evidence shows that the suicide bombers who blew themselves up at the Volgograd railway station and in Trolleybus No. 15 have not been trained in the Volgograd region. Presumably, they have arrived in Volgograd with a specific task to destabilize the city by suicide bombings, taking a heavy toll in deaths and injuries," he said. 12:03 GMT: Six families of people who died in the Volgograd bombings have each received payments of 2 million rubles ($60,000) from the authorities, while 28 families of people injured in the blasts each received compensation of 200,000 rubles ($6,000). Other families of the victims will receive money as soon as possible, Volgograd Governor Sergey Bozhenov says. 11:10 GMT: Volgograd policeman Dmitry Makovkin, who sacrificed his life shielding people from a suicide bomber's deadly blast at the city's train station on Sunday, has been buried in the city’s central cemetery. He was posthumously awarded the Order of Courage. 10:50 GMT: Five people injured in the Volgograd blasts remain in critical condition, the Russian Ministry of Health says. A total of 64 people are still receiving medical treatment. 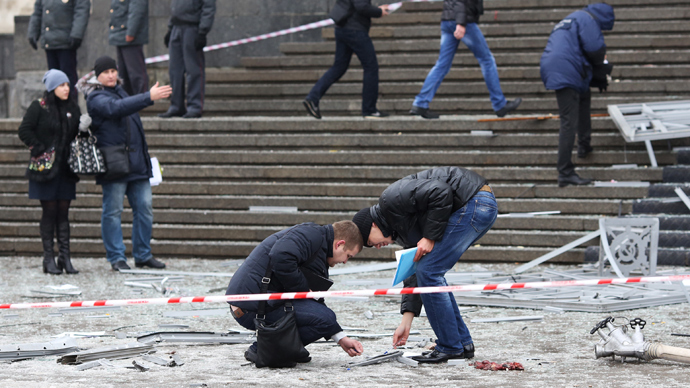 10:20 GMT: The investigation into the suicide bombings in Volgograd has already produced its first results, Russia's National Anti-Terrorism Committee announced. 13:26 GMT: Six people injured in the Volgograd blasts remain in critical condition, Interfax reports a medical source as saying. According to the source, 64 people are still receiving medical treatment. 12:11 GMT:The Federal Medical and Biological Agency (FMBA) plane with two girls who remain in critical condition after the Volgograd blasts has just landed in Moscow, the Russian Ministry of Health says in a statement. 08:03 GMT: Fifteen more people who now remain in either serious or critical conditions may be flown to Moscow on Wednesday and Thursday, said the head of the FMBA, Vladimir Uiba. He said the people will be transported in small groups of two or three. On Monday and Tuesday 15 people injured in the Volgograd blasts were flown to Moscow hospitals. Two girls were also taken to the capital on Wednesday. 07:28 GMT: Two girls who remain in critical condition after the Volgograd blasts have been transported for further treatment to Moscow by plane from the Federal Medical and Biological Agency (FMBA). One of the girls, a three-month-old infant is still in critical condition. The 9-year-old was taken off artificial lung ventilation on Tuesday but her condition also remains critical. Two specially-equipped ambulances took the girls to a plane which was also specially equipped. 06:32 GMT: The counter-terrorism operation in Volgograd, codenamed “Vortex-Anti-Terror” continues into a third day. The operation began on December 30 after the blast in a trolleybus, which followed the bombing of the city’s railway station the day before. Over 3,000 police officers guarded the city streets on New Year’s Eve, local police reported. A total of 4,579 facilities, including 2,700 from the private sector, 112 parking lots and 27 bus stations were checked. 04:46 GMT: President Putin visited one of the hospitals in Volgograd where the injured from twin bomb blasts are being treated. He spoke with the doctors and with some of the injured, wishing them a speedy recovery. Prior to hospital’s visit, Putin laid flowers at the site of Monday’s explosion. A total of 34 people have been killed in the violence that has shaken the southern Russian city. 03:55 GMT: There was no excuse for terrorist attacks committed in Volgograd, the Russian president said early Wednesday. "The hideousness of crimes committed here in Volgograd, needs no additional comments. There is no justification for whatever motivated the criminals’ actions for crimes against civilians, especially women and children," said President Vladimir Putin, opening a meeting on combating terrorism in Volgograd, where he arrived on Wednesday morning. At the same time, Putin pointed out that Russian Special Forces were doing everything to “ensure the safety of civilians, primarily of women and children." Putin discussed measures for battling terrorism with the head of the FSB Alexander Bortnikov and Russian Minister of Internal Affairs, Vladimir Kolokoltsev. 13:45 GMT: Putin declared that Russia would "fiercely and consistently continue the fight against terrorists until their complete annihilation", speaking at a New Year’s reception in the Russian Far East city of Khabarovsk that suffered massive flooding this summer. “This year, we had to face problems, including inhuman terrorist attacks in Volgograd and unprecedented natural disasters in Russia’s Far East,” Putin said. According to the latest data, 34 people were killed in the terrorist attacks in Volgograd, while 72 others were wounded, with 62 of them currently in hospitals, Russia’s Health Ministry reported, as cited by Interfax news agency. 13:05 GMT: Over 150 units of firearms, as well as almost 5 kilograms of drugs, have been seized in Volgograd in a special operation, Interfax reported citing the region’s security forces as saying. Following the terrorist attacks in Volgograd, people have been actively helping the security forces, calling them and reporting on any suspicious objects in the city. 12:37 GMT: Israeli Prime Minister Benjamin Netanyahu has condemned the terrorist acts in Volgograd and expressed his condolences in a telephone conversation with President Vladimir Putin. Putin’s spokesman, Dmitry Peskov, said that the conversation took place at the request of the Israelis, Itar-Tass reported. 12:10 GMT: The father of the three-month-old girl wounded in the Volgograd trolleybus blast has been found in Volgograd. He has already identified the bodies of the girl’s mother and grandmother, who died in the explosion. The girl’s condition is critical and is causing concern. As soon as it’s stabilized, the baby will be sent to Moscow for treatment. 10:48 GMT: As of Tuesday, over 550 people have donated blood for the wounded in the Volgograd terrorist attacks. Total blood donated was 200 liters, with 400 people participating. The institutions that accept blood donations are set to keep working until all would-be donors have given blood, RIA Novosti news agency reported authorities as saying. 09:27 GMT: The condition of two girls in intensive care after being wounded in the Volgograd blasts remains critical. Doctors are considering whether the girls will be transferred to Moscow for further treatment. On Tuesday, one of the girls, a 9-year-old, was taken off artificial lung ventilation and is able to breathe herself. Treatment for the second girl, a three-month-old infant, is to be assessed by specialist pediatricians from Moscow who are flying to Volgograd. Five women and two men have already been flown to Moscow for treatment on Tuesday following the two terrorist attacks that struck the southern Russian city. 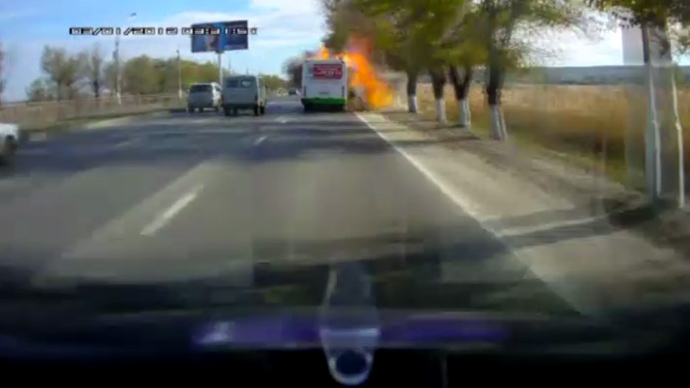 07:55 GMT: The death toll in the Volgograd trolleybus explosion, the second terrorist attack in two days, has risen to 16 people, Russia’s Health Ministry said. A total of 34 people have been killed in the violence that's shaken the southern Russian city. 07:50 GMT: Volgograd policeman Dmitry Makovkin, who sacrificed his life shielding people from a suicide bomber's deadly blast at the city's train station on Sunday, has been posthumously awarded the Order of Courage. He will be buried January 2. Makovkin died trying to prevent the suicide bomber from entering the railway station. His actions significantly reduced the number of casualties in the attack, investigators say. 07:47 GMT: Additional police troops are now patrolling the streets of Volgograd, with over 5,200 police and Interior Ministry troops engaged, says the representative of the Operational Headquarters in the Volgograd Region, Andrey Philipchuk. “Over 4,795 objects, including 1,606 places from the private sector, have been checked since this morning. Also 500 crowded places, such as railway stations and shopping malls, have been inspected,” he says. The identities of 174 people have been checked in accordance with migration laws, he says. 03:20 GMT: The number of casualties in the two blasts has risen to 33, with another victim from the Sunday railway station blast dying in the hospital, the Ministry of Emergencies said in a statement. 23:36 GMT: All of the victims of the terrorist blasts have been identified, Emergency Response Unit chief Olga Makarova told reporters. She added that special units of psychologists are working on the scene to assist the relatives of the victims or offer help via a specially set up hotline. 22:00 GMT: The first funeral services for those killed in the Sunday train station bombing will be held on Tuesday for two of the victims, local authorities announced on their website. 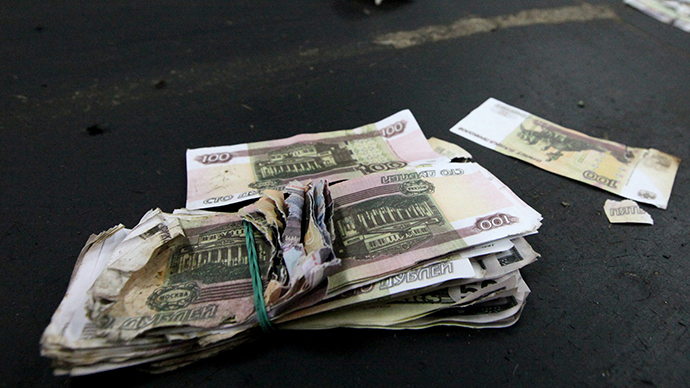 21:11 GMT: Over 100 million rubles (US$3 million) is ready to be transferred to families and victims of the two Volgograd explosions, according to the regional government website. Seventeen families have already received 200,000 rubles for the Sunday explosion at the station. 20:50 GMT: UN Secretary General Ban Ki Moon expressed his condolences for the Volgograd tragedies in a phone conversation with President Putin. Ban also emphasized the need to for international cooperation in fighting terrorism. Putin concurred, noting that the international community must collaborate to prevent terrorist atrocities from taking place. The Russian leader assured the UN chief that Moscow would work within the framework of international law to pursue those responsible for the bombings. 20:33 GMT: In the city of Saratov, 147 people have donated blood for the victims of Monday’s bombings, local medical officials report. “Today the Regional Blood Transfusion Station received 172 people, 147 of which were admitted for a blood donation from which we harvested more than 70 liters of blood,” local health minister Alexey Danilov said, as quoted by RIA Novosti. The shipment of blood will now be sent to Volgograd. 20:12 GMT: The United Nations Security Council has condemned the terrorist attacks in Volgograd, saying that it is “outraged” by the second suicide bombing in the city within a 24-hour period. “These abhorrent and abominable attacks deliberately targeted places of mass gathering, in particular public transportation,” said the Council. 19:46 GMT: People in Ukraine are paying respects to the victims of the Volgograd bombings, bringing flowers and candles to Kiev’s central Independence Square, Maidan. 19:45 GMT: Three of the 14 people killed in the trolleybus bombing remain unidentified, the regional government press office reported. Two of the unidentified bodies are women. 19:42 GMT: The Emergencies Ministry plane has left Volgograd, carrying another seven critically injured victims on board. Earlier on Monday, another plane transported seven wounded people to Moscow hospitals for treatment. 19:34 GMT: The US government has voiced concerns that more attacks might target the Winter Olympic Games in Sochi in February. Washington has offered closer cooperation with Russia on providing security. "We're taking lots of security precautions" related to the Winter Games, a US State Department official said. 19:02 GMT: Aleksy Valento, 12, (L), and his cousin Aleksandr Dolgikh, 11, (R), were inside Volgograd’s railway station. The boys were buying tickets for Aleksey’s father, Vladislav Valento, when a suicide bomber detonated an explosive device. Both Aleksey and Aleksandr died at the scene. Vladislav was hospitalized after losing a leg. 18:30 GMT: As the International Olympic Committee (IOC) expresses confidence that Russia will keep the Games “safe and secure,” RT’s Thabang Motsei reports from the Olympic city of Sochi on what is being done to make sure that the Volgograd scenario will not be repeated there. I'm shocked and saddened by the Volgograd attacks. I've written to President Putin to say the UK will help Russia in whatever way we can. 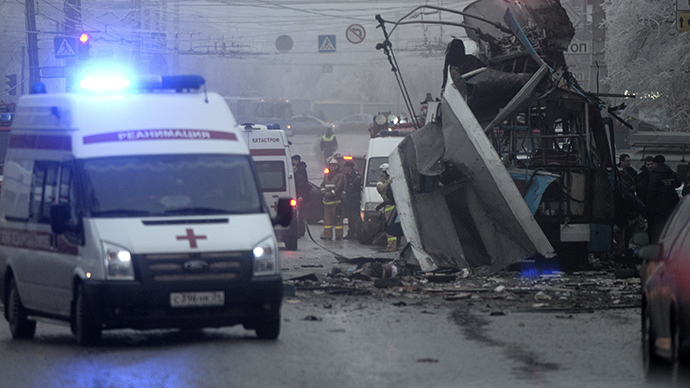 17:34 GMT: At least 27 people injured in the Volgograd bus bombing remain in hospital, including an eight-month-old infant. Two people are still in critical condition, the Health Ministry said in its recent statement. 16:50 GMT: A counter-terror operation has been launched in Volgograd, with over 4,000 police and interior troops engaged, according to the national anti-terror committee. More than 260 search groups and 142 investigative squads are operating in the city, paying special attention to railway stations, shopping malls, and other crowded places. Over 1,500 such places have been checked since morning. Eighty-seven people were taken to police stations for refusing to show IDs, bearing arms, resisting the police, and other offenses. 15:53 GMT: The Spiritual Administration of Muslims of Tatarstan has allocated a million rubles ($30,471) to the families of those killed or injured in the suicide bombings in Volgograd. “We, the Muslims, should not stay indifferent to other people's grief. Our religion teaches us to help people in trouble. That is why we have decided to transfer a million rubles to the families of people who were killed or injured in the terrorist acts in Volgograd," Mufti Kamil Samigullin said, as cited by the Itar-Tass news agency. 15:46 GMT: All of those detained during the police dispersal operation in central Volgograd have been released without being charged, Gazeta.ru portal reported. A total of 50 people were detained. Earlier today, Gazeta.ru reported that about 200 people had gathered for a “Russian rally against terror” event, organized on social networks. The rally was not authorized, according to the portal’s correspondent. 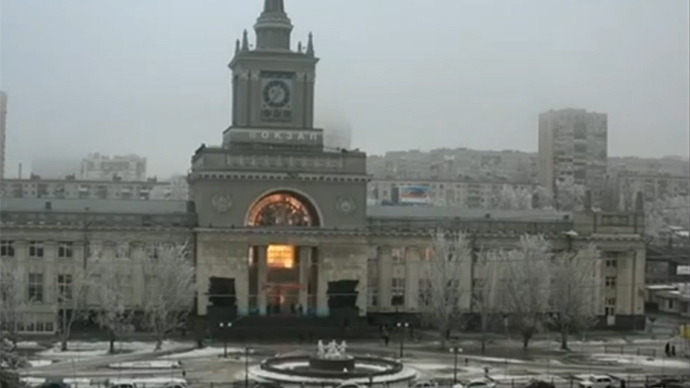 15:30 GMT: Volgograd railway station has been partly opened for passengers. However, the box-office area and waiting rooms will remain closed till Tuesday. The area of the main entrance where the suicide attack took place has been closed for major reconstruction, Itar-Tass reported. 15:19 GMT: The International Olympic Committee (IOC) remains confident that despite recent suicide attacks, Russia will deliver a ''safe and secure'' games in Sochi in February 7-23. 15:05 GMT: Muscovites are bringing flowers to the representative office of the Volgograd region in the capital. 15:04 GMT: As the terror threat level in the region has been set at “yellow,” the second highest, for the next 15 days, Volgograd authorities have called on all residents not to use fireworks during the New Year celebrations as a precautionary measure. 15:01 GMT: The responsibility for security in the region lies “personally” on the heads of each and every citizen of the Russian Federation, Russia’s National Antiterrorist Committee said after an emergency meeting in Volgograd. 14:55 GMT: The Emergencies Ministry plane has arrived in Volgograd for possible transportation of seriously wounded blast victims. Seven patients were transported to Moscow earlier today. 14:42 GMT: At least five people remain in critical condition in hospitals. Some of the injured are expected to be transported to Moscow hospitals “in due course”, First Deputy Prime Minister Olga Golodets said. For now, relatives of the hospitalized are in constant attendance at the bedsides of those who sustained severe injuries. This video was shot in one of Volgograd’s hospitals. 14:24 GMT: The Russia Foreign Ministry likened the Volgograd bombing to “terrorist attacks” in the US, Syria or elsewhere, organized by groups with the “same motivator”, and vowed not to retreat. The Ministry has expressed “deep appreciation” to all world leaders, who condemned the attacks. Such reaction by heads of states Russia considers as a confirmation of the commitment of the world community to increase the fight against terrorists. 14:21 GMT:“Cynically planned on the eve of New Year celebrations, this strike is another attempt by terrorists to open an internal front, spread panic and chaos, cause inter-religious hatred and conflict in Russian society,” Russia’s Foreign Ministry said in a statement published on its website. 14:17 GMT: A video showing Sunday’s blast inside the Volgograd railway station has been published online by LifeNews TV channel. The 16-second CCTV footage shows an unrecognizable man in dark outfit approaching and then trying to go through the metal detector. The next moment a bomb went off. A total of 17 people were killed in the blast, at least 44 were injured. 13:43 GMT: The Spiritual Administration of Muslims in Moscow has launched a fundraiser to collect money for the families of the bombing victims. “Moscow Mufti Ildar Alyautdinov has personally donated 50,000 rub ($1,520),” the Administration press-service told RIA Novosti. Volunteers from Moscow’s Spiritual Administration of Muslims are planning to go to Volgograd “to provide help and moral support”, the Administration said. In Moscow there will be organized visits to hospitals and blood donor stations if needed. 13:22 GMT: Moscow volunteers have expressed their readiness to abandon festive meals during the holidays to be able to donate blood for those injured in the Volgograd blasts, the Mosvolonter movement said on its website. “On behalf of all volunteers in our city we offer our condolences to the families of victims of the two blasts in Volgograd,” the statement reads. The movement has called on everyone to join them at a blood donor station on January 4-5. 13:05 GMT: The Emergencies Ministry has sent a plane equipped with five medical transportation units. Each of them has four beds and relevant medical equipment needed to fly a patient. The aircraft is also carrying two special ambulances and medical personnel, which will assist with the relief effort in Volgograd. Earlier on Sunday, a similar plane flew seven survivors of the railway station bombing to Moscow. 13:02 GMT: Sergey Avdienko, retired police colonel, former Interpol officer, speaking to RT, said the attacks are "exactly a part of the same chain, including the past explosion in October, the people behind it are the same. It’s quite clear who is behind these attacks – it’s people from a place fairly close to Volgograd; I’m speaking about the Caucasus, where radical Islamic groups thrive. The entire point of doing this, especially on the cusp of the New Year, is to intimidate the population and to destabilize the situation in the country as well, particularly in view of the coming Olympic Games that are going to take place in Sochi, which is about 700 kilometers from Volgograd. The choice of this place for suicide attacks is obvious. It has to do with the history of the place itself. This city was known as Stalingrad in World War II, and to my mind, bringing those horrifying suicide bomb attacks to the town has to do also with the intimidation of the population of this particular place to show that Islamic extremists are aiming at the heart of the Russian nation." 13:00 GMT: Peter Powell, Managing Director of Crisis Management at Visor Consultants told RT that the terrorists concentrate on obvious targets, "and it’s quite clear, even though Volgograd is somehow 400 miles away from the sight of the Winter Olympics. It’s a transport hub for this part of Russia. So transport, communication, economy – all these issues are pretty obvious targets to hit and produce an immediate impact on the Russian public, and not only Russian but also for those who are travelling there next year." 12:47 GMT: Volgograd police are dispersing a crowd of some 200 people who gathered in the city center on a “Russian rally against terror”, organized on the social network, Vkontakte. Over 12,000 people have subscribed for the event. Police are detaining those who turn up because the meeting has not been authorized, Gazeta.ru news portal reported. 12:27 GMT: FSB director Aleksandr Bortnikov said there are "tangible leads" available that could speed along the investigation of the Volgograd bombings. The Ministry of Interior has meanwhile started taking additional security precautions. "Apart from increased security set up in advance of the new year's festivities, the MoE will undertake additional safeguards. More thorough checks are being carried out, especially in more congested, public places, like public transportation hubs," the police said, adding that a number of special units are working the streets, including canines. 12:23 GMT: Moscow will receive another injured person from Volgograd for treatment, ITAR-TASS learned from the Federal Medical-Biological Agency. The same agency will be dispatching 14 of its specialists to Volgograd on an Emergencies Ministry flight. Aboard the plane will also be two mobile hospital units of the FMBA, the agency said. 12:12 GMT: The United States Ambassador to the Russian Federation, Michael McFaul, has condemned the suicide attacks in Volgograd on behalf of the US. “All my thoughts and prayers – about victims of these heinous atrocities,” McFaul said on his Twitter account. США решительно осуждают теракты в Волгограде. Все мои мысли и молитвы – о жертвах и пострадавших в результате этих варварских злодеяний. 12:08 GMT: Volgograd may not as an attractive target for terrorists as Olympic Sochi, but hitting it is still quite painful for Russia, Asher Pirt, Researcher in Russian Affairs for the British East-West Centre, told RT that “Sochi is quite a hard target to base the attack, but places like Volgograd are incredibly significant because of the struggle that went on here in 1943; it’s an important place to attack but sadly it’s weaker than Moscow or Saint Petersburg,” he said. 12:00 GMT: The French government condemns the terrorist attacks in Russia, the country’s Foreign Ministry said in a statement. “France with all decisiveness condemns the terrorist act, which was conducted this morning in Volgograd. This attack, which targeted civilians and public transport, is a cowardly and barbaric action,” it said. France expressed condolences and its full support to the people of Russia in its fight against terrorism. 11:54 GMT: A representative of the populist Liberal Democratic Party (LDPR) has proposed canceling a moratorium on the death penalty in Russia for selected offences. "Should the moratorium on the death penalty be canceled, there would be much less crime on the territory of the Russian Federation,” a State Duma deputy, Roman Khudyakov, said. However, the United Russia party has ruled out the possibility of lifting the moratorium. 11:44 GMT: FSB director, Aleksandr Bortnikov, who also chairs the anti-terror committee, has arrived to Volgograd. He is expected to hold an emergency meeting soon. 11:37 GMT: A basketball game scheduled for January 6 has been canceled over security reasons. “We can’t risk people’s lives,” Artem Panchenko, General Manager of Volgograd’s Basketball club "Red October" said. 11:21 GMT: Doctors are now reporting 41 injured, 27 of whom are in hospitals. 11:19 GMT: Deputies from the Communist Party of the Russian Federation have called on President Putin to impose a nationwide day of mourning and cancel all planned entertainment events, saying all festive activities would be “blasphemous and inappropriate”. 11:05 GMT: More than 600 people have volunteered to give blood at the Volgograd regional blood bank, the head doctor Andrey Valikov told RIA Novosti. Despite an overabundance of blood, people keep showing up all the same. The space in the building is not enough, so the line stretches far outside. "There is already enough blood. Our needs are well covered, we have more than enough... but we will not refuse anyone," he said. 11:00 GMT: Russian TV programming has experienced changes after the Volgograd attacks, the various channels' respective press offices told RIA Novosti. The changes had mainly to do with content of a comedic nature, most such programs have been removed and substituted for others. 10:31 GMT: The death toll from the trolley suicide bombing is expected to go up due to the critical condition of many of the injured, Veronika Skvortsova - head of the Russian Ministry of Health, told Interfax. "At this time, there are 14 fatalities already. Twelve people have died on the spot. And that figure is not final, it is expected to grow," she told the Rossiya 24 channel. 10:30 GMT: Belarus President Aleksandr Lukashenko voiced condolences to Russia over the Volgograd suicide bombings. “We in the Republic of Belarus have learned with great grief the tragic news about the deaths in the terrorist attacks in the city of Volgograd,” Lukashenko’s message to his Russian counterpart, Vladimir Putin, said. “Individuals behind those inhuman deeds have no excuse,” it added. The Belarus leader wished a speedy recovery to the survivors of the two bombings. 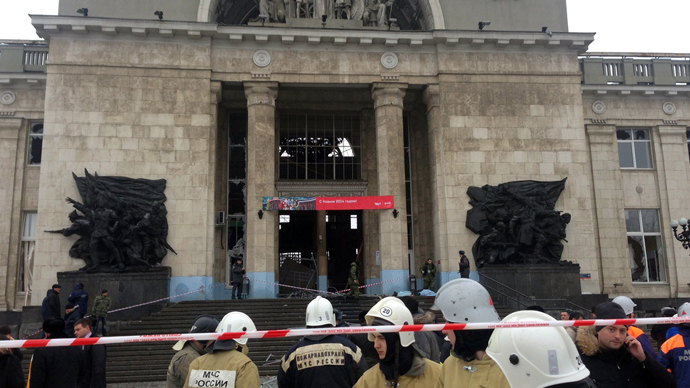 10:25 GMT: The identities of the victims of the railway station bombing have been determined, according to a statement by the governor's office of the Volgograd region, RIA Novosti reports. "At present, all the identities of the of the victims of the railway station blast have been confirmed. Fourteen people have died at the scene, three of them later at hospitals," a statement said, adding that there are 12 men and five women among them. 10:23 GMT: Belarus President Aleksandr Lukashenko voiced condolences to Russia due to the Volgograd suicide bombings. “We at the Republic of Belarus have learned with great grief the tragic news about the deaths in the terrorist attacks in the city of Volgograd,” Lukashenko’s message to his Russian counterpart Vladimir Putin said. The Belarus leader wished recovery to survivors of the two bombings. 10:09 GMT: Russian security troops killed three militants, who were planning terrorist attacks during the New Year holidays, Russia’s National Antiterrorist Committee reported. The three militants, including a gang leader, were blockaded and killed on Monday in Kabardino-Balkar Republic in Russia’s North Caucasus. All of them were on the federal wanted list for crimes, including the killings of two Penitentiary Service officers, the statement said. A woman with a little girl was in the house at the time it was surrounded. Both were released by the militants and escorted to a safe distance by security forces. The militants refused to surrender and were killed in the ensuing firefight. Two security troops received minor injuries in the operation, the committee said. 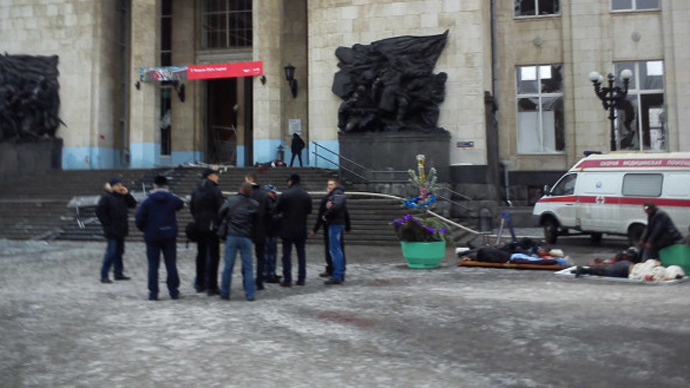 10:05 GMT: The suicide bomber behind the bombing of the Volgograd railway station may be Pavel Pechenkin, a security source told Interfax. He was born in the city of Volzhsk in Mari El republic in central Russia. In spring 2012, he joined a Dagestan-based militant gang after converting to Islam and changing his name to Ansar ar-Rusi, the source said. The information was not officially confirmed. A DNA test of the remains of the bomber is currently being conducted. The news agency’s source said Pechenking’s father donated a blood sample to match against that of the terrorist. 10:01 GMT: There is a heavy police presence in town, various officers, including canine units, are performing checks and searches, with particular attention being paid to the migrants, ITAR-TASS reports. 09:47 GMT: The combined total of victims of the Volgograd terror attacks stands at 32, with 72 more people injured, the Emergencies Ministry reported. 09:37 GMT: A million rubles will be given to the families of the victims of the bus blast; others will receive 200,000 to 400,000 rubles, depending on the injuries, authorities have said. Prime Minister Dmitry Medvedev has made the order. 09:33 GMT: Orthodox Christian churches are praying for the victims of the two suicide bombings in Volgograd. Patriarch Kirill, the head of the Russian Orthodox Church, said a special prayer for those currently in hospital in the wake of the attacks, his office reported. Churches throughout Volgograd are holding special services in commemoration of those killed in the bombings and for the health of the survivors. “For years our long-suffering land enjoyed a time of peace and calm. Now some forces are trying to seed panic among our people and instill fear in our souls. That will not happen,” Metropolitan German of Volgograd stated. 09:18 GMT: The Red Square, previously cordoned off because of a suspicious bag, has once again been opened up; the woman who had left the bag was later found to be mentally ill.
09:17 GMT: The Volgograd region has declared a period of mourning, starting on Monday for the victims of the two latest bombings. This is a 48 hour extension of the commemoration, which was originally intended to run from Wednesday to Friday. 09:16 GMT: Russian pole vault champion, Elena Isinbayeva, who was born in Volgograd, says she is shocked by the terrorist attacks on her home city. “I find it difficult to say anything right now. I’m shocked. Nobody among my family or friends suffered, but I am scared, simply scared,” she told Itar-Tass. 09:15 GMT: A doctor at a diagnostics lab told RT that "yesterday, at the time of the blast I was near the railway station. I saw everything. I saw the blast, I saw the bodies, and I helped to evacuate people. Now I’ve come here [to Volgograd’s regional blood center] to donate blood. If it were possible to donate 1 liter, I would have done it. It’s really scary when you see something like this. I’ll never forget it." 09:11 GMT: Authorities have discounted the idea that there was a second device near the trolley blast site. 09:03 GMT: Andrey Valikov, chief doctor at Volgograd’s regional blood center told RT that "after yesterday’s blast we received more than 16 liters of blood. In a short period of time (1-1.5 hours) after the tragedy, hospitals were supplied with blood. We have enough blood and if hospitals need more, they’ll receive it. During the night we received many calls from people who would like to help somehow. Also we had many volunteers who came in the morning, and expect around 300 people to come and donate blood. Though we have enough blood, we’ll accept everyone today and tomorrow; we won’t refuse anyone because we understand that people are trying to help the victims of the terrorist attacks." 09:00 GMT: Moscow's most central point, the Red Square, is currently being evacuated as a safety precaution. A suspicious bag has been discovered, prompting the authorities to cordon off the entire area. 08:53 GMT: Russian Railways advised passengers to arrive early to stations because it ramped up the security checks and screening may take additional time. The company calls on the people to immediately report any suspicious objects to police officers. "I was going home from work, I was giving a lift to a woman, to a co-worker of mine who lives nearby. As I was turning around I heard an exploration. I was already waiting in a queue and another driver asked me “What’s happening?”. Somebody said “There must be an explosion somewhere”. We heard a cry a way ahead, I drove up to save some children but I was told the only wounded person there was a driver. So I drove up to a driver, his name was Sergey. I was told the person who was selling tickets for the trolley bus was dead. I saw about six dead bodies myself." Another eyewitness, Evgeniy Volchansky, said that "we saw debris, remains of bodies, there was very strong smell of things burning and of TNT. Very soon the police showed up and representatives of the governor, investigative activities started, there were a lot of people trying to offer help." 08:41 GMT: Vladimir Markin of the investigative committee has confirmed the connection to between the Sunday and Monday bombings. 08:40 GMT: President Putin has given new orders to boost security measures across the entire country, with special attention paid to Volgograd, the anti-terror committee said. 08:31 GMT: The death toll rises to 14 people. 27 are now hospitalized, two of whom are in critical condition. 08:30 GMT: An explosion equal in strength to 4 kilograms of TNT took place in the attack, according to the investigative committee. 08:00 GMT: The president of Russia's Olympic Committee, Aleksandr Zhukov told ITAR-TASS that "as far as the Olympics in Sochi are concerned, all precautionary measures have been taken... I don't think any further measures in the aftermath of the Volgograd terror attack are going to be taken, we are confident that everything that could have been done, was." Among the security measures are special spectator ID cards and other state-of-the-art technologies. 07:50 GMT: Arthur Atayev, Russia’s Institute of Strategic Research told RT that "the purpose is to destabilize all of Southern Russia, especially in the run up to the Winter Olympics in Sochi. Those behind the attack pursue the goal of showing to their own investors in turn that terrorism, jihadism is bearing fruit, it's profitable and has a foothold in Southern Russia. Right now it’s very difficult to sort out who the specific sponsors or clients are, but if you analyze the terrorist underground in the North Caucuses or in the world in general, you can come to the conclusion that those customers are part of a complicated chain, and if you go to the top, you arrive at certain political forces that are located outside Russia and they have been launching destabilizing processes in the country for a long time in order to reduce its foreign policy influence and also the influence of the Federal state in Russian regions." 07:45 GMT: The aftermath of the deadly trolley blast. 07:42 GMT: The number of dead has risen to 13 people, an ITAR-TASS source reported. Cell phone cam footage, however, is being collected from bystanders. 07:41 GMT: The bus was from a time before video surveillance started to be used in public transportation, complicating the investigation of how the situation transpired inside at the time of the blast. 07:40 GMT: The number of wounded in the trolley bus incident has risen to 28 people, 22 of which have been hospitalized. A five to six-month old child is in critical condition, a spokesman told the Rossiya 24 channel. 07:30 GMT: Coroners have identified 17 victims of the Sunday blast at the railway station - among them two children, sources tell Interfax. 07:26 GMT: Aleksey Popov, former member of an Alpha Special Forces unit, believes one possible reason for the bombing could be to dissuade people from coming to the Sochi Winter Olympics. "All the attacks in Volgograd are a part of the same chain. Terrorists try to spread fear ahead of the Winter Olympics so that people become scared to go to Sochi. No wonder they have chosen the holiday season to make it even more painful for the people and to draw plenty of world attention. But I believe it won’t have any effect on the Olympics and the people who were planning to come will still do it. They are safety because almost $2 billion was allocated to security measures, that’s even more than the sum for London." "It’s harder to penetrate there, so they decided it will be easy to strike Russian city closer to the North Caucuses. Suicide bomb attacks are carried out in Russia by mujahidin. It’s very likely that a group affiliated with the Caucasus Emirate could be involved and we talked about ethnic Russian suicide bombers, which these organizations try to recruit." "Another possible perpetrator is a mujahidin who converted into Islam about a decade ago and eventually joined the mujahidin. He is a former Russian military person by the name of Pavel Kosolapov and he is from Volgograd. He was involved in a train bombing back in 2007 and suspected of several other bombings. He also claims he is responsible for a train bombing in 2009. He was silent since then so we can consider the possibility that he was planning the 'big show' all these years." 07:10 GMT: Volgograd emergency help phone lines have been set up. 07:05 GMT: CCTV cam footage is being collected by security services. 07:00 GMT: Rumors of other terror attacks in Volgograd - namely the tram blast or the attack that supposedly occurred at the 'Monolith' factory - are completely unfounded, Svetlana Smolyanova, head spokeswoman for the Volgograd Region interior ministry told Interfax. "There are no other bombings to report. People have constantly been phoning in with questions regarding that, but there's nothing to confirm the rumors." 06:58 GMT: Moscow security has likewise been ramped up, regional security head Aleksey Mayorov tells Interfax. 06:50 GMT: A number of companies in Volgograd are contributing to the transportation, providing commuters with rides to work. People are terrified of using public transportation services. 06:41 GMT: The FSB now officially says there is a strong chance today's trolley bus blast is connected to yesterday afternoon's railway station suicide bombing. 06:40 GMT: The Ministry of Health now puts the number of injured at 25. Doctors from a special unit dealing with catastrophic-accident injuries are soon to arrive. 06:37 GMT: An eyewitness told reporters that there is currently a "transportation breakdown" in Volgograd, it is at a standstill. 06:36 GMT: Alina Averyasova, eyewitness: [before the blast] everything was as usual up until the blast itself. Just before the blast everything was calm and peaceful. We were sleeping at home because today is a holiday. And just after the blast panic took off. 06:30 GMT: Eyewitness, Alina Averyasova, says that "at the moment of the explosion I was asleep, I woke up because of an enormous blast. I heard the glass shattering in the first two stories of the building. I looked out the window, it was still dark, and I saw a bus that was ripped by a blast and people were running away from it screaming. Some of them were wounded, a lot of people were panicking... Within minutes a police car and an ambulance and a fire engine drove up. All the roads and streets were sealed off, nobody could approach the area, people got evacuated, nobody could approach. Police came over and started looking for a bomb nearby. this is all that I saw and I was very scared." 06:26 GMT: The blast was of such magnitude that it shattered the windows on neighboring shops and apartment buildings, authorities tell reporters. 06:25 GMT: Burns and multiple traumas have been sustained by the victims of the trolley blast. Moscow is standing by to receive more wounded, if the need arises, health ministry head Veronika Skvortsova told RIA Novosti. 06:18 GMT: FSB director, Aleksandr Botnikov, has been ordered by the President to fly to the scene, RIA Novosti reports. 06:20 GMT: The situation is being handled effectively - no shortage in medicine has been reported and efforts by emergency services are proving to be quite effective. 06:16 GMT: The number of fatalities varies from at least 10 to 15 at this point, as official sources differ on the matter. 06:13 GMT: Ministry of Health spokesperson said a child has been badly injured and is in critical condition. 06:06 GMT: The Emergencies Ministry has strongly tightened security in Volgograd. Teams of psychologists and other doctors are also being dispatched to the scene of the blast, the ministry reported. Their plane is to leave Moscow at 10:30AM local time. 06:00 GMT:"We are terrified. Everyone disembarked from buses and trams to walk on foot. I live 200 meters away from that place, I was just passing it on my way to work," Sergey Stukalov, an eyewitness, told RIA Novosti. 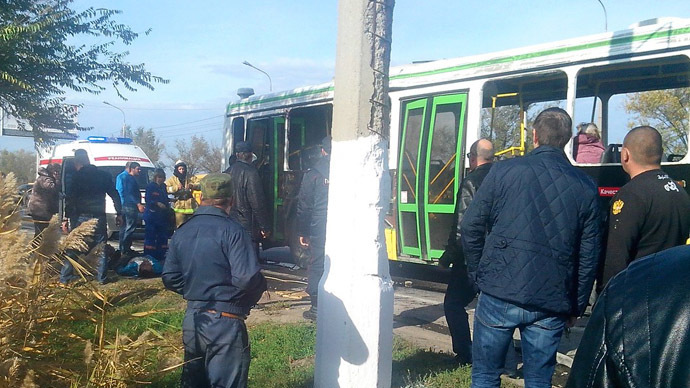 Sergey also said that the blast occurred on the No.15 trolley route, connecting a suburb to Volgograd's downtown area. 05:55 GMT: Panic has spread on Twitter, describing yet another blast - this time in a busy tram. However, the rumors have since been proven false. 05:50 GMT:"The people are in a state of shock and bewilderment. A second terrorist attack in two days....a third in recent months. I was there 15 minutes after the explosion occurred," Artem Tolkachev, an eyewitness, told Life News. 05:43 GMT: The death toll from the blast has risen to 15 people, with a further 23 receiving injuries, the Volgograd Region's vice-governor Vasiliy Galushin told Interfax. "The emergency services have reacted very swiftly. All those injured have been taken to hospitals, as their identities are being determined," he said. 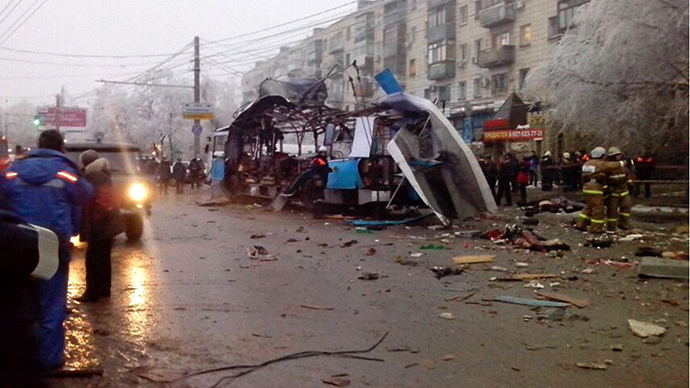 05:37 GMT: According to witness reports to ITAR-TASS, there were many students on the bus. "There was a loud 'pop', then a flash, everything was enveloped in smoke," one female witness said, describing the sudden realization. 05:34 GMT: The Investigative Committee now puts the number of injured at 15. 05:30 GMT: In describing the character of the blast, ITAR-TASS law enforcement sources have said that it appears to be a suicide attack, "judging from the body fragments characteristic of such a bombing." 05:28 GMT: President Vladimir Putin has met with the head of Russia's FSB, Aleksandr Bortnikov, who has briefed him on the situation, the Kremlin press office reported. 05:23 GMT: The Investigative Committee's spokesman has informed the press the incident is being treated as an act of terror. 05:21 GMT: Bodies were seen scattered next to the vehicle, which has been split nearly in half by the powerful blast, which took place as the trolley was passing one of the city's busy markets. 05:17 GMT: Police are currently at the scene investigating. 05:00 GMT: A trolley bus blast has claimed 10 lives in Volgograd, just one day after 17 lives were lost in the city's railway station explosion in a suicide bombing.